The likely Republican candidates for president might not be saying much about their candidacies just yet. But, as the saying goes, the medium is the message. Facial decoding firm Sensory Logic has figured out ways to interpret their messages. Although President Barack Obama is substantially boosted by the killing of Osama Bin Laden, and a relatively unknown few Republicans debated in Greenville, South Carolina, Campaign 2012 nevertheless is starting to take shape. 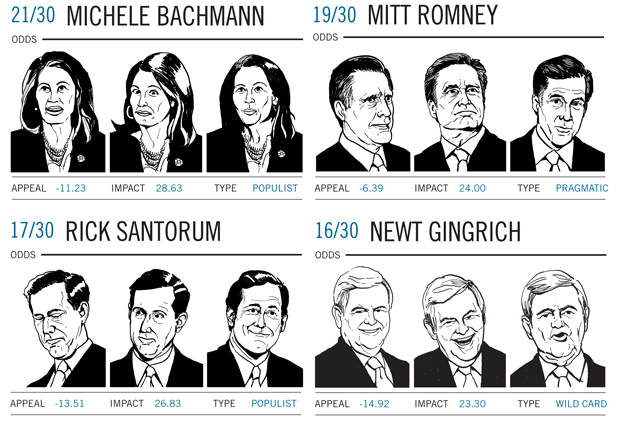 During the campaign, many Americans will meet GOP contenders for the first time. But what the presidential hopefuls say may not matter that much. Their faces may be doing the heavy lifting. A scientific, emotional “facial coding” of the candidates and their expressions may determine who gains traction and who gets the nomination. After the 2010 the midterm elections, more campaigns than ever began using neuromarketing techniques, that is, studying the brains of voters to aid in crafting messages that would appeal to them and win votes at the polls. Turning the tables in 2011, neuromarketing researchers can now measure candidates’ own brain-driven facial movements and emotions, in order to assess their performance, fine-tune campaign marketing, or even predict election outcomes. Dan Hill, president of Sensory Logic and author of Emotionomics and About Face, is a facial coding expert who works with leading Fortune 150 companies, professional sports teams, and government agencies (e.g. TSA). Sensory Logic helps clients who market to consumers by measuring their emotional facial responses to various stimuli in an effort maximize appeal. Companies also hire Hill to assist in employee recruitment and talent management. Hill has been diagnosing candidates and predicting elections since 2004. In October 2007, he had Obama 2-1 emerging as the Democratic presidential nominee when a famous former White House advisor and current GOP pundit had him at 20-1. He was ahead of the pack in predicting the demises of Fred Thompson and Rudy Giuliani. Historically, Hill says, the happier candidate triumphs (think frowny losers Dole, Kerry, McCain…). Sensory Logic uses proprietary Cartesian Graphs to measure and score the impact, appeal, and engagement, emoted and emitted, by the candidate’s face. A person can show four types of smiles but a “’true smile’ which is a strong natural smile seen around the eyes and mouth” is more rare, distinctive, and powerful. Hill’s analysis suggests when a politician should drop out or not even enter the race (when his heart, or face, is not in it). For our own visualization of Hill’s full analysis of the current crop of prospective candidates–and what their faces are saying about their mood and their odds, click here. But how reliable and useful are the analyses and findings? Hill tells Fast Company he has not been hired by political campaigns; but his client list is growing, diversifying, and becoming more global, he says. Recently Sensory Logic clients asked that their names be removed from the firm’s Web site due to project confidentiality and competitive reasons. With the assistance of Ekman, the CIA uses their own facial coding and “microexpressions” analysis in recruiting and conducting espionage. What did they recently glean from Bin Laden’s facial gestures? Hill also revealed he was asked though the BBC by an unknown sponsor to interview and code people in Karachi, Pakistan (he declined). Hill concedes some challenges and limitations of political facial coding. The data is based on his own observation, and coding and using other (not as proficient or expert) coders might mean less reliability and consistency. Also, the analysis and findings derive from a limited sample of candidate speeches. What if the data set relies on a candidate’s few bad hair days? And while politicians cannot fake their facial muscle movements and those corresponding “core emotions,” they could fudge to a degree and manipulate the “personality traits” they want to project. Hill thinks the data can also help a candidate understand how to differentiate from the field–as a brand, (e.g. if the pack shows anger, then stand out as bright), or to assess the competition, strengths, and weaknesses. The coding may point to the need for a candidate to be truer to his or her authentic emotions versus being staged (think Gore), or to be more singular and polar emotionally and personality-wise, instead of all over the map and bland. The 1960 Nixon-Kennedy debates famously underscored the power of mass media and ascendant television to shape elections and shined a harsh light on candidate facial expressions. In 2008, no one exploited the power of emerging social media channels more effectively than Barack Obama. In 2012, who can turn facial media and smiles into victory?